It’s crazy to think that I’ve been at this for 39 Months. 2) I don’t want to trade my car in, the used car market is not very appealing. I had honestly been considering a used Honda CR-Z for about $12k with only about 40k miles and a ‘Lifetime” Powertrain warranty. I just hit 12k on this car and it still drives like new. There are a few small door dings that I plan to get fixed eventually. After finding red paint on my side panel and a few weeks ago on my driver’s side door, I decided to park away from the inconsiderate guy who drives a van with the bumper hanging halfway off his car. 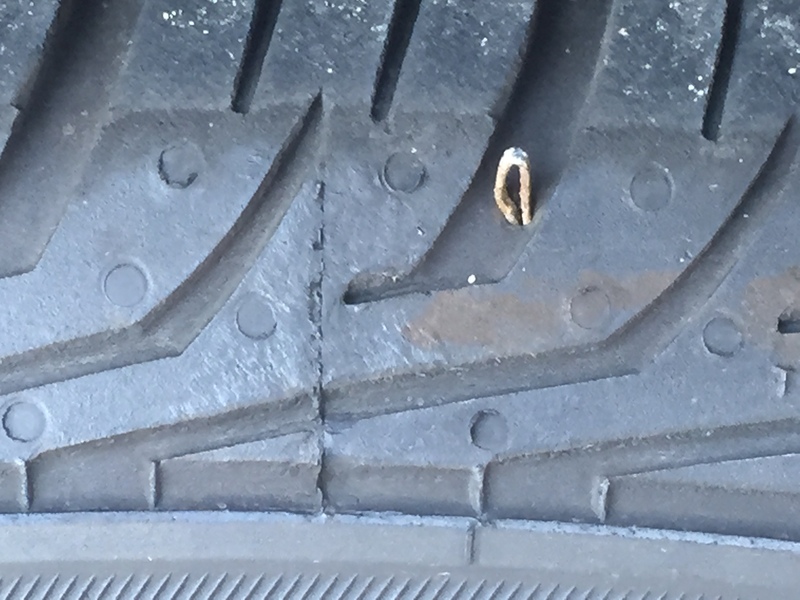 I did have an unplanned expense with the car this month, again… A nail in my tire, right in a spot that wasn’t reparable. $195.38 for parts, labor and tax. I’m not sure if this was one of the tires that I got replaced back in November. I did a staycation recently, probably the worst vacation experience since splitting with my ex. I got strep, the above nail in my tire. Chills, splitting headache. The following weeks were not very enjoyable either. More drama in the dating scene. The guy I liked I felt was starting to lose attraction to me. Combine that with an issue involving a $500 fine for a dog the owner said he could have at his condo, a $300 fine where they towed his car the last day he was there, time spent not paying rent because of being stubborn and it going down as an eviction on his record, corporate housing / being borderline homeless. Then a schedule that was opposite of mine. I had a little bit of heart but at the same time I’m not ready for someone I just met to move in with me. Putting myself out there in the dating scene but I keeping my guard up until I find someone deserving of my time and affection. There is a guy I do like from a personality / physical standpoint…but he pays for half his mom’s rent, can barely pay his own bills and has a massive chunk of student loan debt. Interest is accruing and his job situation is kind of spotty. In 4 years I’d like to have enough money set aside to buy a home. His financial situation is dire and I don’t think that would happen. I hate to make everything about money but it was one of the reasons why my parents divorced, why I am paying student loans still after graduating 7 years ago… It’s important to get right.